I won't be actively contributing to the UESP wiki for the forseeable future, partly due to my latest addiction, Fallout 3. I probably won't be back until TES V is released. This user is a Daedric Prince. Mod This user has installed some official mods. Imperials are by far the best race. I'm just your average Oblivion addict, playing on the Xbox 360. As the userbox hinted, my PC is too old to run Oblivion. As a result, I haven't got access to the CS (Construction Set). I logged in on the UESP on 16 November 2007, and before that used the site whenever I got stuck or ran across a bug. Pelagius is a male Imperial born under the Mage birthsign, with a custom Combat class. He has completed the Main Quest and all 'good' guilds. He has reached lvl. 50 and has retired after the Oblivion crisis wore over. Sir Fastolf is another male Imperial, born under the Warrior birthsign with a custom combat class. He has refounded the Knights of the Nine and defeated Umaril the Unfeathered in both mortal and sprirtual plane. He now lives in the priory of the Nine along with his fellow knights. Gregory is a male Dunmer, bron under the Thief birthsign with a custom stealth class. He has become the Listener of the Dark Brotherhood and the legendary Gray Fox. Skilled with both Blade and bow, he has killed the entire Cheydinhal guard. I usually just ask questions here and there, and answer other questions if I can. I've added the NPC tables to the Knight of the Nine page and the Battlehorn-man-at-arms page. I did a large revamp at the Tamriel Imperial Legion page, though that was immediatly reverted by other editors. I started up the Tamriel page on Knights of the Nine. 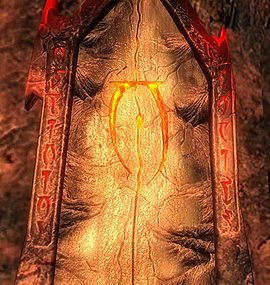 Favourite non-Shivering Isles Battle-cry: You are weak, like the gods you serve! These are the other games that I('ve) play(ed) on the Xbox 360. Assassin's Creed "This is impossible. The apprentice defeats the Master?" Bioshock "One Man's vision. Mankind's salvation." Mass Effect "I am the vanguard of your Destruction." Call of Duty 3 If a man does his best, what else is there? - George S Patton. Tomb Raider Legend "Anyone who stands between me and that stone, dies!" Halo 3 "I am Truth, the voice of the Covenant! ... And thus you must be silenced." Sandbox 1-- Project of my own. It is a list of all notable characters from Oblivion. Sandbox 2-- My personal "cookie". Sandbox 3-- list of color codes for Backgrounds. Fanfiction–– Sheogorath has sent his mortal champion to choose sides at Cylarne.